January is traditionally a time for New Year’s resolutions - a healthier diet, more exercise or trying something a little bit different. With so many people doing ‘dry January’ and choosing vegan and vegetarian options, local restaurants are reflecting customers’ tastes and culinary trends by creating food and drink that offer great flavour with all the extra benefits of superfoods. At The Talbot in the village, they are taking this a step further with a healthy living event. On Tuesday 29th January they are inviting local yoga teachers, walking groups and fitness experts to give free taster sessions and advice, including Enigma bikes and Inokim of Brighton – who will showcase electric scooters. 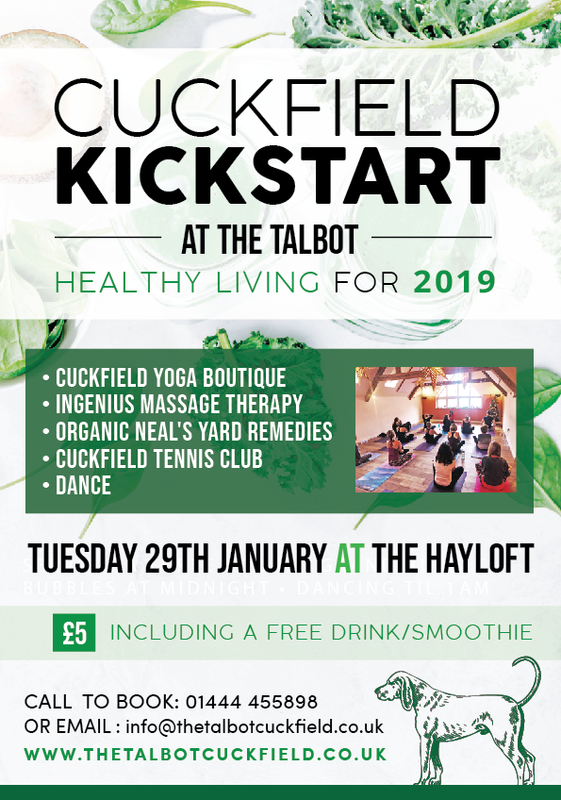 The event will be held in the Hayloft at the Talbot. With the bar creating cocktails and mocktails to invigorate and energize using blueberries, pomegranate, turmeric, ginger and honey to boost immunity and revive. Whether you are looking for a custom-built bike or someone to pair up with for walking or tennis, there will be something for everyone... not to mention an uplifting party playlist in the bar. Tickets for the event include a drink and food and are on sale at the Talbot or through Eventbrite. To find out more call 01444 455898.